100% fruit filling. Always organic. Nothing unnecessary. Setting standards. No junk promise. Suitable for vegetarians. 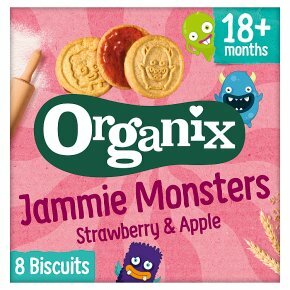 For little explorers on the go... our Jammie Monsters have a delicious strawberry & apple filling. They are the perfect treat! SAFETY ADVICE: For little ones 18 months+ who are sitting down and supervised. The real ingredients in our Jammie Monsters may stain so prepare for mess!